Posted on Friday, May 31st, 2013 at 4:58 am by Pieter van der Westhuizen. Any user of Microsoft Outlook will tell you that you cannot use Outlook without first setting up an account. This account can either be an Exchange server, POP or IMAP account, although Outlook can support any MAPI style account too. In this article, we’ll take a look at how you can access and use these objects in your Outlook add-ins. You can get a reference to the Accounts collection via the NameSpace object. In the following code listing, I enumerated the accounts collection and printed the user name and e-mail associated with the account. DeliveryStore Returns the default delivery Store object for the account. AccountType Use this to establish what kind of account it is e.g. Exchange, POP3, IMAP etc. CurrentUser This property is used to get a reference to a Recipient object that represents the current user for the account. SmtpAddress If you only need the e-mail address of the current account, use this property. Like the Accounts object the Stores object contains a collection that lets you enumerate the stores for a given profile. The Store object contains a number of useful methods. The first we’ll look at is the GetRootFolder method. This method, as its name suggests, returns a MAPIFolder object that contains reference to the root folder of the Store. You can then use this folder to access any child folders. The GetSearchFolders method returns a collection of all the search folders for a specific Store. A search folder is a folder that contains a view of all items that match a specific criteria. By calling the GetRules method of the Store object, you receive a collection of Rule objects for the current session. Be warned though, to call the GetRules method can take a long time on slow connections to an Exchange server! The Store object provides two events, one to let you know when a Store object has been added and another before a Store object is removed. The BeforeStoreRemove event is fired just before a Store is removed. A parameter containing a reference to the store that is being removed is passed as well as a Boolean parameter with which you can cancel the remove action. The Folders object contains a collection of Folder objects for either a Store or a Folder. Each Folder object in turn also has its own Folders property, you can use this to access the folders’ child folders. The following code listing illustrates how to get the root folder of a store and display all its child folders. To delete a folder, you can either use the Remove method on the Folder’s object, or you can obtain a reference to the folder and use its Delete method. The Folder object has three events, FolderAdd which occurs when a folders is added to the Folders collection. The folder that is added is passed into the event as a parameter. FolderRemove is the opposite of the FolderAdd event and occurs when a folder is removed from the Folders collection. Unfortunately, the event does not indicate which folder is removed. Lastly FolderChange can be used to determine when a folder in the Folders collection has changed. As with the FolderAdd event a reference to the folder that was changed is passed into the event. The Outlook Items collection object is used for accessing and enumerating items in Outlook folders. Although it is the best practice and far more efficient to use the GetTable method of the Folder object to enumerate items in a folder, you can still use the Items collection to perform a number of tasks. To remove an item from the items collection you can invoke the Remove method and pass in the items index. To add an item to the Items collection you can use the Add method. You can specify the type of object to create by passing the type name to the method. The Items object has similar events as the Folders object. However, there are a couple of things you need to look out for when using these events. The ItemAdd event occurs when one or more item is added to the collection, however, this event does not fire when a large number of items are added at once. The ItemChange event fires when a new item in the collection is changed. As with the ItemAdd event a reference to the item is passed to the event as a parameter. Finally, the ItemRemove event occurs when an item is removed from the collection. Unfortunately, a reference to the item that has been removed is not passed into the event. For more information about Outlook Items and Folder events please see Outlook Items and Folders Events explained. Good article. Consider correcting the spelling of “Atores” in the title to “Stores”. I see that you’ve done that now. I created a User Store, adding a folder, added the path to the folders in ADXOlFormsCollectionItem.FolderNames and tied with ADXForm, but when i select these folders are not creating form! 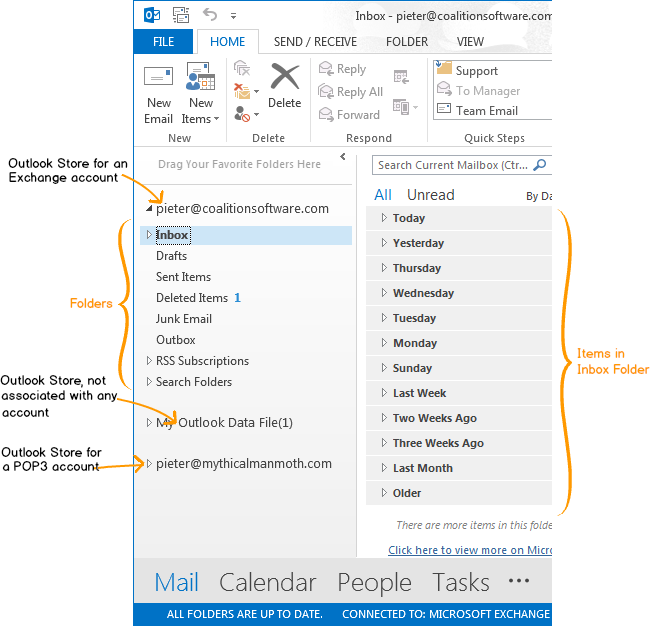 If I specify a folder from the outlook store for an exchange account form is created! If I understood you correctly, you want to display a custom region for a folder? Make sure you’ve set the folder path correctly and that you specified the FormClassName. Also, make sure the ExplorerLayout property is set to the correct value. Yes, you understood me right. But for folder in the user store, outlook region is not created! for folder in outlook store all fine! If I set ExplorerLayout = ADXOlExplorerLayout.ReadingPane, for both folder created outlook region. Have a look at Andrei’s suggestion. It sounds like this might be your problem. Pieter, where i can see Andrei’s suggestion? Pieter, thank you very much!!! If you create an IMAP account you get a new store for that Account, however “Personal Folders” is still the default store, and if try to get the default store programmatically it will be “Personal Folders”. How then can you programmatically figure out what the IMAP store is? You can’t simply look for a store named the same as your account email address, as you could go in and change the name of the IMAP store and now you have a name disconnect between your email account and IMAP store. You also can’t just look at the store type for a particular store because there might be multiple email accounts using IMAP. I’m not sure I understand what you need. Do you need to user to select a store or do you want to get the default store and check if it is an IMAP store? You can use the AccountType property of the Account object to check whether the account is an IMAP account. Can you pint me to this functionality in VBA, please? But I don’t find Accounts as a property of outlook session object. Nor do I find .Stores as a property. I am trying to access account information, specifically for an mailitem about to be sent. I can’t seem to locate any reference Account in the namespaces I see in my project. The Accounts property on the Namespace object is only available on Outlook 2007 and up. In order to access/create accounts in Outlook 2003 and below, you’ll need to use Extended MAPI – which is not ideal to use in managed code. Take a look at this post on OutlookCode.com for more info. Mil gracias por este blog, no sabes cuanto me gaste en encontrar esta explicación. Mil gracias!!! I am new to Microsoft office and working on a solution to extract MSG files from a PST file. Thanks for the quick response. I did tried mentioning the path as you have told, but got the same error. However, one thing to notice here is that although I have Office 2013 installed on my system, I have not configured it. My mailbox is apparently still on lotus notes :(:( and would be moved to Outlook sooner. Could that be causing a issue? Although I dont think so considering all supporting files should be there with installation. Did you start Outlook and does it have at least one mail account yet? I just setup my outlook with a test account. However, I am getting the same error. Where are you running the code from?From an add-in? Using VSTO or Add-in Express? For this application, I just write a console application using VSTS 2013. I have added Microsoft.Office.Interop.Outlook reference to the project. Also, if the above code throws error while removing the PST from default profile, then any suggestions on what should be done here? It seems the RemoveStore method returns an error when emails associated with another account has been pasted into the new store’s Inbox folder. It works if it does not contain any emails or if it contains email associated with its own account. Indeed that was the issue. Thanks much for your help. I have a similar requirement as above. Extract Outlook Message files from PST file and then move the PST file to a different folder. I tried closing the process before file.move() but still its not working. Also, when I go to task manager I find outlook.exe process running even though I donot have that opened. How to do this? I will highly appreciate any help. Mmm..interesting question. Did you remove the store, using the RemoveStore method, before trying to delete the file? Yes I am removing the store using nameSpace.RemoveStore menthod. I verified this in opened Outlook and the store is getting successfully removed. After that I have released all COM objects too. One thing to notice is that in debugging mode, if I close the outlook.exe process (in task manager) before doing File.Move(), it works perfectly. Do you want to see the code? I can share that with you. Sure, please share the code. I can then test it on my side and see if I get the same problem. Were you able to replicate the issue at your end? But why we should use GetTable method of the Folder object to enumerate items in a folder?? And how much performance I lose using Items collection. You certainly do not have to use the GetTable method, using the items collection is perfectly acceptable. However, the Table object was added in Outlook 2007 to address certain performance concerns with the Items collection. So when working with large amounts of data the GetTable method,which returns a Table object, is the prefered choice. In essence think of the Table object as a readonly rowset, that only allows reading of the data and does not allow any changes to be made. It is a light-weight in memory datasteam. It is comparable to the DataReader object in .Net – which allows for very fast data reading. Also can you tell me which dll is used here? Where do you get the error? Can you post the code you’re using? I’m sorry I’m late to the discussion. This is a very helpful article. Is it possible to write this code so that it ran in a standalone Windows exe or service (i.e., versus running only from within Outlook itself)? You can use the Outlook object model in a standalone application; see e.g. As to using it in a service, Microsoft doesn’t recommend doing this; see https://support.microsoft.com/en-us/help/257757/considerations-for-server-side-automation-of-office. My Outlook account is made of two mailbox. How can I generalize the interception of the specific Inbox root folder to which a processed email belongs? but if the mail belongs to a subfolder then I just get the parent folder, nor the main root. I don’t understand if you process incoming emails, outgoing emails, or some (all) emails. To get the store, the folder is located in, you call Outlook.MAPIFolder.Store, then call Store.GetDefaultFolder() to get the inbox folder on that store. When an Office add-in gets loaded, Office supplies it with a reference to the Application object (from the host’s object model). OutlookApp is a property that points to such an Application object; the property is declared on the add-in module; the add-in module makes sense only if you use Add-in Express. In all other circumstances, you should replace OutlookApp with an Outlook.Application object that you obtain yourself.